It is the most widely pasta used for cooking, and even the more ancient custom. It is called the “crust” perhaps because it actually needs to be left for several hours, wrapped in a damp cloth, before being baked. 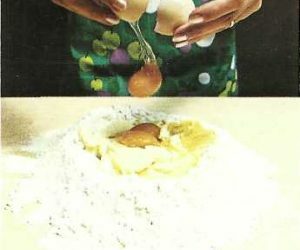 There might be a pasta frolla cake “fat” and a pasta frolla “lean”: the first, extremely brittle, is made of flour and butter in a ratio of two to one, the second the ratio of flour and butter or other fat, is three to one. That “fat” includes the addition of an egg every pound of flour, that “lean” instead requires the addition of two eggs with a little salt (10 g per 500 g of flour), and a little bit of water, depending on the type of flour used. The pasta frola cake, mixed the various ingredients, it should be worked as little as possible. We know the ingredients for the different types of sweet and savory.